The Administration of The Graha Maria Annai Velangkanni comes directly under the Archdiocese of Medan. The Archdiocese of Medan is located in the province of North Sumatra. The province has 419 islands with different ethnics including Melayu Deli, Batak Toba, Batak Karo, Batak Pakpak, Batak Simalungun, Batak Mandailing and Nias. Majority of the people from Toba and Nias ethnics are Christians, while the people from Mandailing dan Melayu ethnics are Muslims. They speak a mix of languages but Indonesian language is commonly used. The Catholic Archdiocese of Medan belongs to the Roman Catholic Church. The head of the Catholic Church is His Holiness Pope Francis. 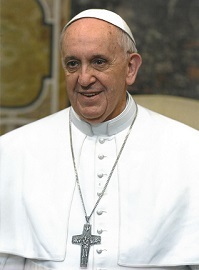 Pope Francis was born on 17 December, 1936 in Buenos Aires, Argentina and baptized as Jorge Mario Bergoglio. Jorge Mario Bergoglio was ordained a priest on 13 December, 1969. He was appointed as a Cardinal on 21 February, 2001 by Pope John Paul II. A papal conclave elected him as the 266th Pope on 13 March, 2013 and placed in the office of Bishop of Rome on March 19, 2013. The Apostolic Nunciature to Indonesia is a diplomatic position within the Vatican, equivalent to an embassy. It is located at Jalan Merdeka Timur 18, Jakarta-Pusat. The Apostolic Nuncio of the Holy See to the Republic of Indonesia serves both as the ambassador of the Pope (as head of State of Vatican City) to the President of Indonesia, and as a delegate and point-of-contact between the Catholic hierarchy in Indonesia and the Pope (as head of the church). Since July, 2017 the Apostolic Nuncio of Holy See to Indonesia is assigned to Msgr. Piero Pioppo. His is the Titular Archbishop of Torcello, Veneto, Italia. He was born in Savona, Italy on 29 September 1960. He completed his theological studies with a specialization in dogmatic theology and is an alumni of the Pontifical Ecclesiastical Academy. He was ordained a diocesan priest of the Acqui diocese on the feast day of Saint Peter and Paul, 28 June, 1985 by Bishop Acqui, Livio Maritano. He was ordained a bishop on 18 March, 2010 at St. Peter’s Basilica, Rome. Msgr. Piero joined the Vatican diplomatic ranks since 1993 and has served in Korea, Chile, Cameroon and Guinea Equatoriale. He is proficient in several languages ​​including English, French and Spanish, and also his Italian mother tongue. 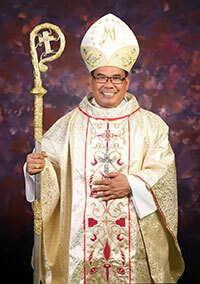 The Archdiocese of Medan is headed by Archbishop Kornelius Sipayung, OFM Cap. He was born on 26 Agustus 1970 in Bandar Hinalang, Purba, Simalungun, Sumatera Utara, Indonesia. He underwent the novitiate at the Capuchin Convent of Pematang Siantar and was educated at Christus Sacerdos Minor Seminary, Pematang Siantar. He undertook further studies at the Saint John College of Philosophy and Theology, Pematang Siantar. In 2002, he continued his study in the field of dogmatic theology at the Pontifical Gregorian University in Rome. On August 22, 1998, he made the perpetual vows as a member of the Capuchin Order in the Province of Medan and was ordained a priest on December 11, 1999. On 8 December 2018, Pope Francis identified Kornelius Sipayung as the new archbishop of Medan. Msgr. 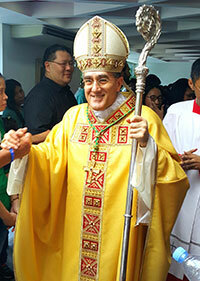 Sipayung was ordained as the Archbishop of Medan on 2 February, 2019. As the high-priest and teacher of his diocese, the Archbishop presides over its whole life in the name of Christ. Vicar General : Elias Semangat Sembiring, O.F.M. Cap. 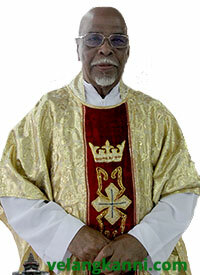 Diocesan Secretary : John Rufinus Saragih, O.F.M. Cap. Father James was born on 3 July 1938 in a town near Madurai, India called Micheal Pattinam. In 1957, he entered the Jesuit order by joining the Novitiate in Beschi College, Dindigul, India (1957-1959) for the first two-year of theology studies. He the completed seminary high school in Seminari Tinggi St Paulus Kentungan, Yogyakarta, Indonesia (1967-1969). He then furthered his theology studies in St Mary’s Kurseong India (1969-1971). The administrative service of the Graha Maria Annai Velangkanni is handled by Sister Jeanne Panul and Sister Yustina Sinaga. Sister Jeanne is seconded from the Sisters of St. Joseph Congregation (KSSY), Medan and is currently attached with the Graha Maria Annai Velangkanni. She is responsible for liturgy, secretarial services, finance, lodging and pastoral activities. 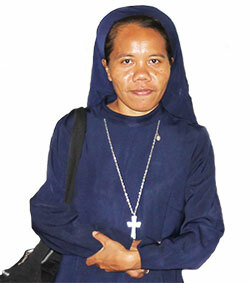 Sister Yustina is also seconded from KSSY, Medan and is currently attached with the Graha Maria Annai Velangkanni. 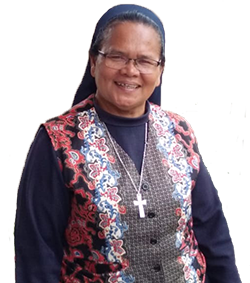 She is responsible for sacristan duties (arrangement of liturgical books, vestments, and other things necessary in the celebration of Mass) and also in the pastoral section of the Graha Maria. Both of them are assisted by other sisters – both local and foreign.